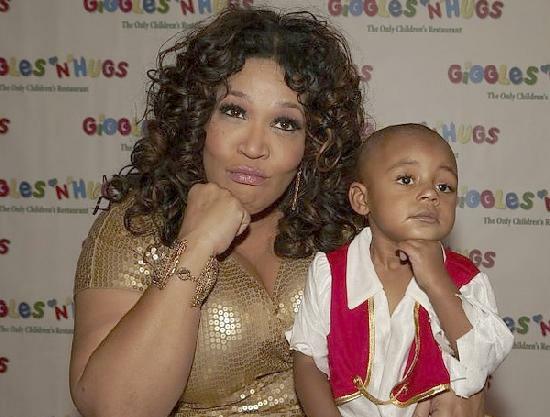 *Raising a child God dropped in her lap suddenly has changed the way Kym Whitley looks at life, love, and family forever. The comedienne is the star of new OWN docu-series, “Raising Whitley,” where she and her menagerie of friends band together to raise a baby. When Kym signed up to mentor a troubled young girl, she never imagined herself becoming a mother in an instant. After her mentee gave birth to a little baby boy, she quickly gave the deuces to the maternity ward and left the child for Kym to raise. Now in its second season, the show has warmed the hearts of audiences, left impressionable lessons and shared belly-deep laughs as the crazy life of Kym, baby Joshua and “The Village” unfolds. Before the show landed on OWN, Oprah and Kym were out at dinner one night with her then newly acquired child. Kym’s story blew the media diva away and eventually the show had a home. The first season has proven a blessing to so many people and has since inspired women, single mothers to raise villages, and others to adopt. “People come up to me all the time and say ‘I love your show.’ I’ve thought my show would be a sitcom or a talk show,” she explains. “Never in a million years would I have thought my show would be docu-series/reality because you always think reality is something crazy. We can have the crazy but we can also give to people. Little Joshua is now 2 years old and will be celebrating his third birthday in January. In the new season of “Raising Whitley, Rodney Van Johnson, Joshua’s daddy who co-parents with Kym, is working on reviving his acting career. There will be new adventures and look out because Joshua’s talking. Besides raising a little boy and doing her stand up thing, the actress says reality television has certainly changed her perspective on working in Hollywood. Years ago she was offered an opportunity to star in a reality show, but turned it down in fear that she wouldn’t be taken seriously as an actress. But now, her tune has changed, admitting this new wave of television is here to stay. Reality television is leaving a lot of people in the dust, many without jobs. But recognizing the opportunities, “Raising Whitley” has been a springboard for more work and further success for Kym. She’s also got a new show debuting on ABC Family called “Young and Hungry,” set to premiere later this year. Season two of “Raising Whitley” premieres this Saturday, Jan. 4 at 9pm E/P on OWN.